RCSEd Diving Medicine online module, which is completed in advance of the 2 day Level 1 (Medical Examiner of Divers) Course. DDRC Healthcare partner with the Royal College of Surgeons of Edinburgh (RCSEd) to provide access to the Dive Medicine module for students as a prerequisite to attending the DMAC Level 1 course. The module typically runs over 3 months and contains all of the academic content required for the Level 1 and Level 2D courses, as agreed by the Diving Medical Advisory Committee (DMAC) / European Diving Technology Committee's (EDTC) medical sub-committee and the European Committee for Hyperbaric Medicine. Each module is about 100 hours of study, therefore, approximately 9 - 10 hours of study per week is required. Please be aware that the e-modules do involve a lot of study and will therefore require dedicated time to complete. Please note that the RCSEd online module is separate from the DDRC DMAC courses and currently costs £555.00 (fees are subject to annual review) and should be booked separately. The module dates are set by the RCSEd and commence in January, March, June and September each year. You will follow a schedule, with group discussions and assignments to complete at specific intervals. The module must be completed 1 month prior to the DDRC DMAC course start date. Upon completion of the module, the Royal College of Surgeons of Edinburgh will send proof of completion and confirmation of Continuing Professional Development Certificate. Following this, a medically qualified applicant will then be eligible to attend the DMAC/EDTCm Level 1 and /or Level 2d course(s). The module introduces the key concepts of dive medicine, including the medical observation of divers, diseases and organisms specific to the marine environment and the management of medical conditions and emergency situations. - Demonstrate an understanding of the physics, physiology and pathophysiology relevant to the diving environment. - Demonstrate knowledge of the equipment and procedures used in diving. - Demonstrate an understanding of how diving accidents happen, how to identify them and how to manage them. - Demonstrate an understanding of how the remote medical practitioner can help to prevent a diving accident by giving sound advice on safe environmental conditions, monitoring of divers, care of the health diver and fitness to dive. Register and pay for your chosen DMAC Level 1 course (remember to leave 4 months between the completion of the module and the start of the DMAC course). There has been considerable interest in this course for personal or professional reasons and applications from non-medically qualified health care professionals are welcome. However, please note that without a Primary Medical Degree, it is not possible to proceed to any Diving Medicine related qualification, such as the DMAC/EDTC Level 1 or 2. Please Note: There are two routes to studying for the RCSEd dive module, depending on whether you require the Diploma in Remote Medicine or only the Diving Medicine module in order to attend the DMAC qualification. 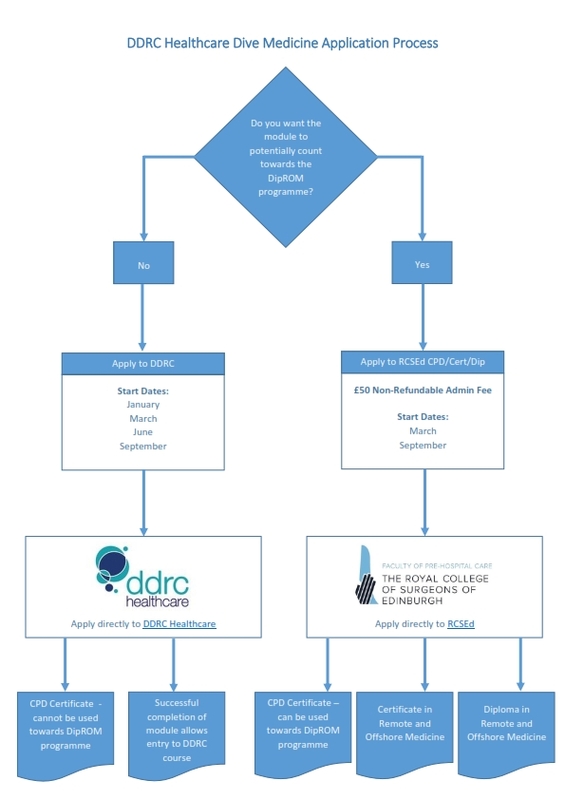 Please read DDRC/RCSEd Flowchart and links below before enrolling.